bodybodymoreless (origins), features artists Duda Bebek, Caroline Carlsmith, Dirt (Amy Grant and Gary Webb), Addoley Dzedge, M (Abbe Findley and Brook Hsu) Ashley Wick, and Nicole Wilson, along with an architectural intervention designed by Jan Ulmer. This exhibition is curated by St. Louis-based artist Amanda Bowles. Bringing together disparate approaches, bodybodymoreless (origins) highlights artists that explore a relationship to time through touch and memory. Works investigate interpersonal bonds, relations with oneself and others. They utilize voice, think about legacy; they look forward and back. Wholes, parts of wholes, holes – cycles, tracings, and recollections seeking to find ways towards something called home. Duda Bebek (1983 Gothenburg, Sweden) lives and works in Stockholm, Sweden. She received her BFA and MFA at Valand School of Fine Arts. Bebek has exhibited internationally with selected solo and group shows at at Nevven Gallery (Gothenburg), Steinsland Berliner (Stockholm), Gillmeier Rech (Berlin), HFBK (Hamburg), Zero LA (Los Angeles), Den nordiske ambassade (Copenhagen), Büro Weltausstellung (Wien). Caroline Carlsmith is an American visual artist and writer currently living and working in New York City. She completed her BFA in Studio Art and BA in Visual Critical Studies at the School of the Art Institute of Chicago in 2009, and her MFA in Art Theory & Practice at Northwestern University in 2014. Carlsmith has exhibited her work domestically and internationally, including at The Hills Aesthetic Center, the Mary and Leigh Block Museum of Art, and Flux Factory, and has been artist in residence at the Vermont Studio Center, ACRE, SÍM Reykjavic, and Residency 108. She has been the recipient of numerous grants, including the CAAP Grant from the Chicago Department of Cultural Affairs and the Center for Interdisciplinary Research in the Arts Grant from Northwestern University, and is also a founding board member of the interdisciplinary residency program Summer Forum for Inquiry + Exchange. DIRT - A collaboration between artists Amy Granat and G. William Webb. Addoley Dzegede is a Ghanaian-American interdisciplinary artist whose work investigates notions of belonging, migration and location, and hybrid identities. Through a variety of media and techniques, she explores the metaphoric potential of materials, familial histories, textile traditions, and the ways in which color and pattern are used to as a means to assign belonging. Dzegede received her MFA from the Sam Fox School of Design & Visual Art at Washington University in St. Louis. She has been an artist-in-residence at the Arteles Creative Center, Foundation Obras, Nes Artist Residency, and The University of Kansas, as well as a post-graduate apprentice at the Fabric Workshop and Museum in Philadelphia. Recent regional and national exhibitions include Overview is a Place, SPRING/BREAK Art Show, New York, Another Country, 50/50, Kansas City, Color Key, Contemporary Art Museum St Louis, and Surface Forms, The Fabric Workshop & Museum, Philadelphia. International exhibitions and screenings include The Labs @ Chale Wote, W.E.B. Du Bois Memorial Centre for Pan-African Culture, Accra, Ecology without Borders .01, [.BOX] Videoart Project Space, Milan), and In Deep Ecology, Tenerife Espacio de las Artes, Tenerife. Recent awards include the 2018 Great Rivers Biennial award and a Creative Stimulus Award from Critical Mass for the Visual Arts. M - One thousand years into the future, two women with two wigs in the shade of curcuma (turmeric), send a message to present day Earth. M, a name derived from the Roman numeral for 1000, is the life project of Abbe Findley and Brook Hsu. 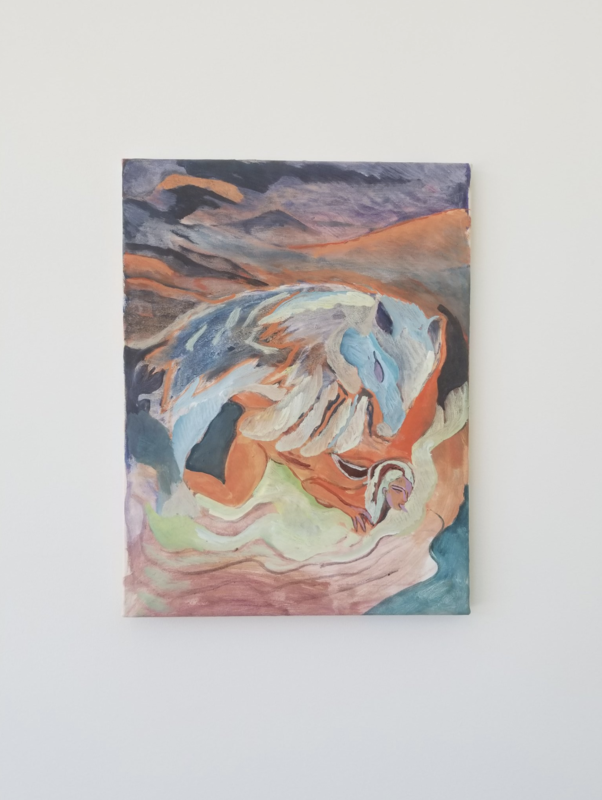 Ashley Wick (Born 1987, Nebraska), explores the connection between love, longing, natural phenomena, fear, and human impact on the natural world. In Wick’s animations and sculptures, she brings to life and anthropomorphizes disembodied body parts, animals, and insects to tell her stories through song and wordplay. Wick applies a poetic and often metaphorical language in her painted animations and sculptures, using rhythmic verse and loops to gain new meaning with each cycle. Wick received her Master of Fine Arts from The Pennsylvania Academy of the Fine Arts School, Bachelors from the Kansas City Art Institute, and spent a summer at The New York Studio School. She has exhibited internationally in Paris, France, throughout New York City and Philadelphia is venues such as NADA New York, SPRING/BREAK Art Show, Bull & Ram Gallery, Fleisher Ollman, Marginal Utility, The Woodmere Art Museum, and The Pennsylvania Academy of the Fine Arts Museum and in Auburn, Alabama at Auburn University’s Biggins Gallery. Wick recently completed an artist residency at Galerie Charlot in Paris France, was a recipient of the Fleisher Wind Challenge, Linda Lee Alter Award for Painting, an Emerging artist grantee from the John Anson Kittredge Fund, and was invited to participate in the inaugural Sedona Summer Colony Artist Residency. Ashley currently lives in Philadelphia, Pennsylvania and Nome, Alaska. Nicole Wilson lives and works in Queens, NY. She received her MFA from Northwestern University in 2014 and her BFA from Tyler School of Art in 2010. She currently teaches as an adjunct professor at Tyler School of Art. Last year, she completed a project called Ötzi at Three Kings Tattoo in Brooklyn, NY, with publication forthcoming. Her most current project, Perfidia, is a multi-year project that engages losses in familial memory, ancestry, Americana, and ethnicity by retelling stories through objects left behind. Wilson’s work is largely based on an un-telling of the stories held within objects. Through long process-driven unconventionally-exhibited projects, she uses conceptual conceits and sculptural objects to articulate and own absence and empty space. Alongside site-specific projects in New York, NY and Los Angeles, CA, her work has been exhibited at Crane Arts (Philadelphia, PA), MAAS Space (Philadelphia, PA), OPEN Gallery (Nashville, TN), Habersham Mills (Habersham, GA), and The Block Museum (Evanston, IL). She is an honorable mention of the Efroyomson Contemporary Arts Fellowship and was awarded the Fleisher Art Memorial Wind Challenge. Jan Ulmer founded the Berlin- based studio Jan Ulmer Architects in 2007. The studio implements projects that range in scale from public buildings in urban contexts to furniture design. The firm has realized several significant stand-alone residential commissions, exhibition designs and building conversions. Current works include a large-scale exhibition in Strasbourg, single family houses in Germany and Switzerland and prefabricated modular housing units (in collaboration with artist Simon Dybbroe Moller). After studying at ETH Zurich and University of the Arts Berlin, Jan Ulmer earned his masters in architecture in 2001. Ulmer worked as a project architect at Kuehn Malvezzi from 2002-2007. There he directed projects such as the Friedrich Flick Collection Berlin and the Julia Stoschek Collection Dusseldorf, which was nominated for the international Mies van der Rohe Award. Amanda Bowles is an interdisciplinary artist based in St. Louis. She completed her MFA in Art Theory & Practice from Northwestern University and BFA in Painting from the Kansas City Art Institute. Her work experiments with temporality, utilizing material-specific processes to express a yearning for deep-time in an age of no-time. Employing everyday rituals, she constructs artifacts that visualize duration, loosely coalescent aggregates in video, sculpture, performance, installation, and text. Interested in observing ways relationships between self and other are evolving, as temporal experience is reframed by digital technologies and publics are rearranged into networks – Bowles works between the on and offline. Her practice demarcates the studio as a site for transformation and transmission, for production and performance.